It is a heck of a thing to receive a month’s rainfall in just one week. 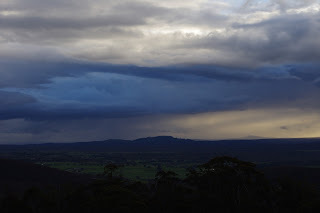 Over the past week 90mm (3.5 inches) of rain fell over the mountain range. 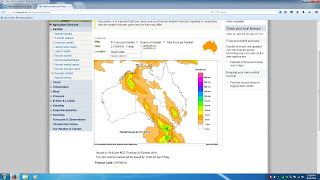 Spare a thought for the people of South Australia. It appears that a cyclone formed over the Southern Ocean and dumped even more rain and wild winds in that state than here. I wasn’t previously aware that cyclones could form over the cold Southern Ocean, but apparently it was one of the worst storms in 50 years. The storm was pretty wild and it managed to plunge that entire state of South Australia into a black out. 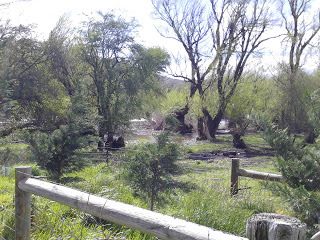 Down here at the farm, the week’s weather was just wet and it fortunately lacked the extreme winds. However, the sky did put on a good show at times! And sometimes the clouds were so thick, they almost looked purple. 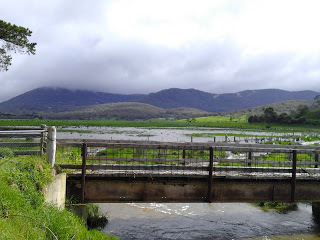 With a month’s worth of rain falling over the mountain range this week, it is hardly surprising that the valley below the mountain range flooded yet again. Fortunately, all of the animals in the various paddocks had been moved to higher ground in the days leading up to the storm. The normally very placid and sluggish, Macedon River (also known as Riddells Creek) was quite the raging torrent of water this morning. 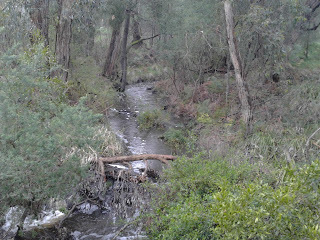 Even the creek that begins near the bottom and eastern edge of my property was flowing with vigour this morning. That creek eventually flows into the river in the above photos. 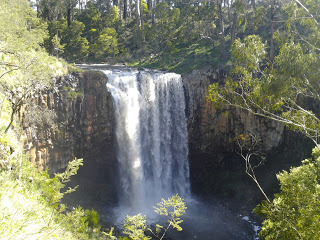 Earlier in the week, the sun shone strongly and the weather was sweet and gentle. I knew about the approaching storm and so decided to continue with the excavations for the new garden terrace before the rain arrived. The area that had to be excavated wasn’t really that large an area so I didn’t believe that the work would take long. Unfortunately, nothing is ever that simple and in the process of excavating, I discovered five very old tree stumps, one of which was quite substantial. They all had to be removed, which is a huge amount of work. Fortunately, Toothy was there to assist me with the excavations. Toothy largely assisted me by lazing around and enjoying the spring sunshine and generally reminding me from time to time, that only foolish humans would be silly enough to waste such glorious spring sunshine by digging! Yes, maybe Toothy is right! 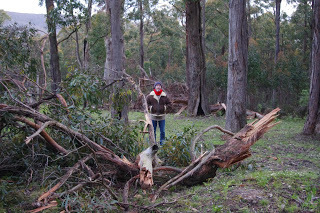 Once the tree stumps were exposed, I was then able to cut them out with the chainsaw. It is important to mention that dirt and chainsaws do not mix very well and even the slightest contact between the cutting chain and any soil will blunt it very quickly. 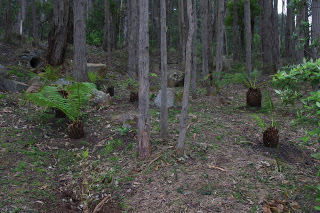 Needless to say, the various tree stumps were covered with lots of soil, and so that provided me with plenty of practice at hand sharpening the chainsaw chain. Then I could relax as it rained for a few days, and all excavation work ceased. Eventually the rain slowed a bit, and a further day of excavations completed the new garden terrace. 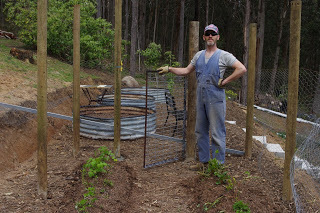 This was exciting because I was then able to place the third potato steel raised garden bed. Did I mention before that nothing is ever simple? Oh yes, I believe I did! 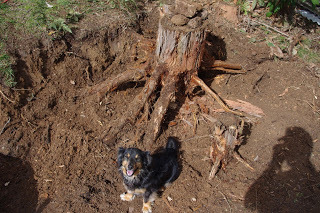 The largest of the old tree stumps had a very large tap root protruding out of the ground at the exact spot where I wanted to place the new potato bed. Well done! About a year ago, I purchased a cheapie tree stump grinder. Previously, I had been using an axe to remove any tree stumps. 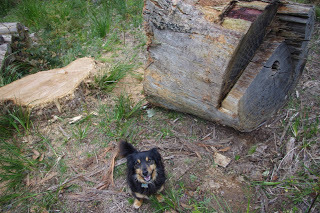 I’m no slouch, but I found that axing a tree stump for several hours – which I’d been doing for several years now – was starting to damage my shoulder joints. And thus, I invested in a cheapie stump grinder. Using that machine is like trying to constrain a wild bronco, with only your arms to control the savage beast as it kicks and bucks, but even that is much easier on my body than using an axe. And best of all, the machine does the job required of it. Once the tree stump was removed, the potato bed could be properly located and dug into the new garden terrace. Observant readers will note that in the photo below, the very top concrete step of the new staircase perfectly reaches the new terrace. Also, a sloping ramp (closer to the camera) has now been constructed. 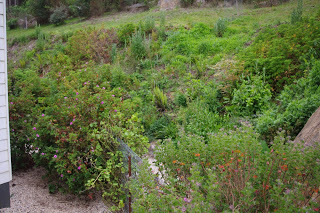 We had even managed to incorporate several of the local Musk Daisy-bush shrubs (Olearia Argophylla) into the gently sloping downwards ramp. I reckon it looks pretty cool. 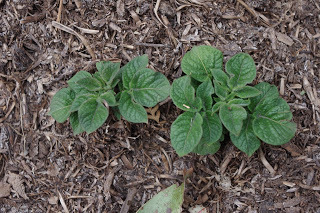 Each of the three steel raised garden beds contain about twenty five potato tubers, so all up there are now about seventy five tubers planted. I don’t believe that we have ever been this organised with the potatoes before! As the plants grow, we will pick off some of the lower leaves and then add additional soil and manure into the raised garden beds. 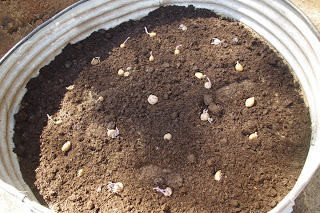 It will be very interesting to note just how productive this method of potato growing is? 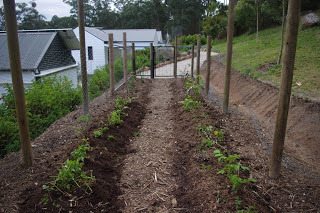 Once the seed potatoes were added to the bottom of the raised garden beds, additional soil and manure were added on top. Now you see them, now you don’t! 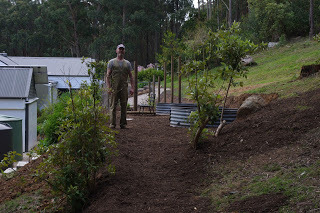 We were aware that yet another massive storm was about to dump even more rainfall over the mountain range on Sunday night, and so we applied a cubic metre (1.3 cubic yards) of composted woody mulch onto the exposed soil on the new garden terrace. 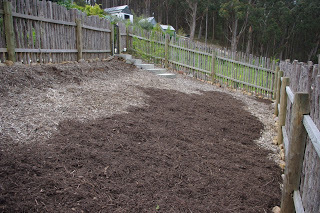 The composted woody mulch slows the movement of any water and instead causes that water to infiltrate into the ground. This is a good thing because water running over bare ground will cause erosion. 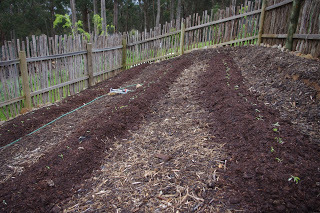 It was very fortunate that we placed all of that composted woody mulch onto the new garden terrace, because last night that massive storm dumped another inch of rain over the farm. Not many people may realise it, but the heavy and persistent rain is a really great opportunity to move plants! 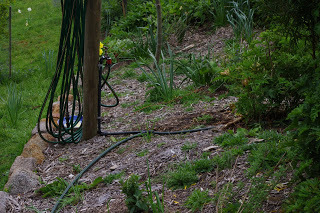 The rains are providing far more water than I ever could by watering, and transplanted plants require a lot of water to become well established. So this week, we moved the remaining berries into the new berry enclosure. One quarter of that berry enclosure contains marion berries, another quarter is raspberries, whilst the remaining half is devoted to thornless blackberries. Certainly, one activity leads into another here! 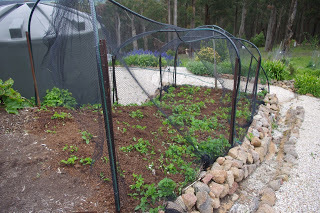 The marion berries were happily growing in the tomato enclosure and those berries had to move, because the tomato, capsicum (pepper), and eggplant seedlings will be planted out in that tomato enclosure over the next few weeks. 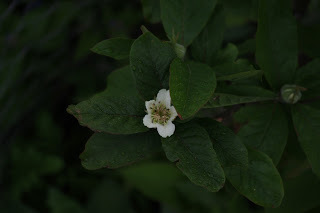 Despite the rain and cool weather, the orchard is still slowly breaking its dormancy, and this week I observed that the first of the pear trees in the shady orchard had produced some blossoms and a few tentative leaves. 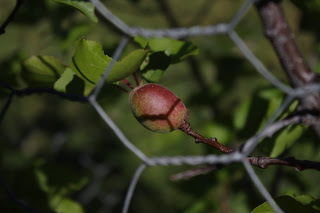 It is a snow pear and is usually both the first pear tree to produce leaves in that orchard and also the last to lose its leaves when the season finally comes to close. The herb garden has also started to produce some early spring growth this week and the colours and shapes are really quite pleasing on the eye! The temperature outside now at about 8.45pm is 6.3’C (43.3’F). So far this year there has been 998.4mm (39.3 inches) which is up from last week’s total of 909.0mm (35.8 inches). Regular readers will know that this blog does not usually touch upon political matters and I see no reason to disappoint those readers. The main reason for this avoidance of all things political is that there are plenty of other places on the Interweb to read about the surprisingly vision free braying of our political class. And to be honest, the dizzying intellectual heights for what passes as political discourse and discussion these days, is perhaps beyond my understanding. However…. The wind has been roaring over the south eastern corner the continent this week and I almost feel as if there is a feeling of change in the air. Whilst I was feeling a foreboding of change, other people down this way have had change forced upon them. Most people would be unaware, but on the Friday just passed, Ford Australia ceased manufacturing vehicles in this country. Ford had been manufacturing vehicles here for over sixty years and now, I guess, the Ford factories are quiet. General Motors (Holden) and Toyota will also soon cease manufacturing vehicles in Australia too. For whatever reason, the political class and/or the population had lost the will to support the vehicle manufacturing industry in Australia. It is my opinion that the people directly impacted by that change, were in a certain sense, thrown to the wolves. There is a human face to that change. As many of you will know by now, I am an accountant. I worked on a production line as a young lad and also again in a manufacturing business many years later as an accountant. Both of those businesses were shut down. And I got to see that process of shutting down a manufacturing business twice from two very different perspectives. So when newspapers report that an estimated 250,000 workers will eventually be “affected” (whatever that means) by the imminent shut down of the vehicle manufacturing industry in Australia, I know some of the stories and faces of people who faced very similar “affects”. Rest assured that the factories themselves don’t stay quiet for long though. Soon the lights get switched on again and the auctioneers move in, the bids are placed, and the tools and machines are quietly shipped off overseas. During the factory shut down that I witnessed, I quickly realised that other countries value their manufacturing industries and are more than happy to take our scraps. And so I saw the containers arrive whilst the tools and machines were rapidly packed up and it could be said that: they performed their final disappearing act. My first job as an adult was with the most social workplace that I have ever had the pleasure of being a part of. Long lunches and late Friday nights at the pub were all part of that job. Honestly it was like walking into a warm and embracing family. Us young ones used to head off to the clubs after those pub nights – if we were still able to – for a very messy end. I was rarely able to escape the messy end, because the housemates at home, who it was fair to say possibly weren’t as messy as I by that stage of the evening, were often very insistent that I hadn’t yet had enough, and could well use some more. Of course, my housemates weren’t being entirely altruistic in their concern for my partying well-being as my job also enabled me to pitch in with the taxi fare to whatever was their choice of destination. Saturday mornings meant coming down like a dirty mongrel, but there was the warm glow to be had – in between the greasy hamburgers, water and retching – that a good night was apparently well spent in the company of friends. Then I was made redundant from that job – through no fault of my own – during the recession that we had to have in the early 90’s and not only did I lose that job, I also suddenly lost a great deal of my social life. The warm and embracing family that came along with that job suddenly disappeared with my income. It was a bit of a shock to me, but I was a young and resilient bloke and so I took that lesson to heart and moved on and was very careful not to repeat it. I wonder what sort of future the “affected” people in the rapidly redundant car industry will face. I have read the average age of the “affected” people is that they are in their fifties and they’ve worked in that industry for over two decades. Sure, they probably received a good redundancy payout so the economic effects of all this will take a while to filter down. But I wonder how many of them had any mates outside of their work and families? Did they have any hobbies or social connections with the wider community or did they give everything over to their work and families? And spare a thought for their unsung wives / husbands / partners who now have to pick up the pieces and form some sort of semblance of a life. I wonder how they’ll all fare? Last night, I travelled into Melbourne for food and friendship. And as I walked around the rainy city at night marvelling at all of the people who were enjoying the facilities, I took a moment to look up into the sky and I was a bit awe struck at all the big skyscrapers. It struck me that at the very top of the skyscrapers the city sky was dominated by signs proclaiming the banks, insurance companies, and superannuation funds and I wondered to myself what that lot actually produced? Speaking of party-time, the marsupials who share the farm have been showing off their little ones over the past few weeks. 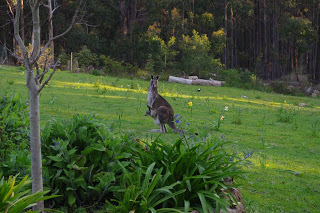 The other day, the editor took this great photo of a young kangaroo with a joey hanging out of her pouch. 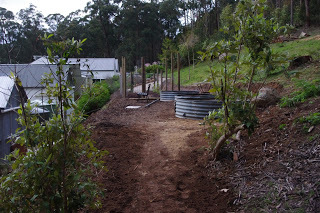 Toothy the long haired dachshund has been assisting me with the construction of the new berry enclosure. A few days ago Toothy was instructing me as to the exact location of the gate post for the far end of the new berry enclosure. 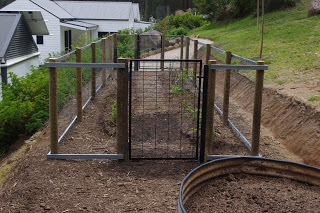 Observant readers will note that in the above photo the far end of the berry enclosure now sports a delightful new steel wallaby proof gate welded up out of all sorts of scrap metal that we had lying about the place. I love my welder! There you go I’ve said it, and we can now all move on and hopefully the editor is not jealous of my love for this 1970’s machine! Funky new scrap metal gates deserve the most excellent surroundings and so the editor and I completed all of the fencing for the new berry bed. I also took the chainsaw for a spin and cut all of the timber posts down to an exact size. Many of the offcuts from those timber posts will make great posts for the various garden taps around the farm! The new berry enclosure is now complete! The tomato, pepper, and eggplant seedlings are growing apace inside the toasty house at an alarming rate. We had an emergency working bee to get the tomato enclosure ready to soon receive the many seedlings. The tomato enclosure was a bit of a minor disaster as regular readers will recall that we had removed many of the berry plants from it and left a total mess behind. 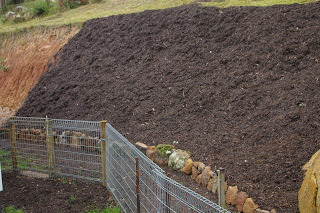 Fortunately, composted woody mulch hides all manner of sins and so we placed one cubic metre (1.3 cubic yards) of that material on top of the mess, and the mess disappeared! Tomatoes love a soil that has plenty of carbon (e.g. woody material) and also nitrogen (e.g. manure). Who seriously wants to disappoint a tomato plant? Not I! So we also heaped another one cubic metre (1.3 cubic yards) of mushroom compost into the tomato enclosure in nice neat rows. 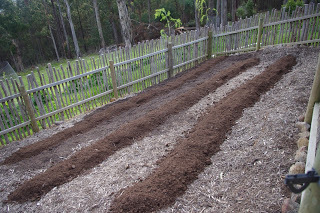 I find it quite ironic that I am now replicating the vegetable growing activities of my grandfather with all those nice neat rows and heaped soil! Oh well, I guess everything old is new again! 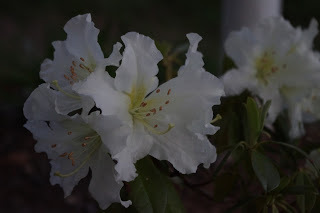 Spring is such a lovely time of year here and I wanted to leave you with some photos of the prolific and also beautiful plants here. One of my favourite plants are the Japanese maples and not only do they look superb all year around, they are also as tough as old boots! 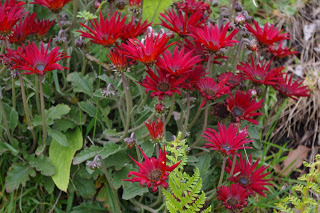 I have absolutely no idea what this plant is, but the red flowers are superb! It also helps that I nicked this particular specimen from a neighbour! I didn’t really nick the plant (are cuttings theft, I ask you?? ), but it does make for a good story! 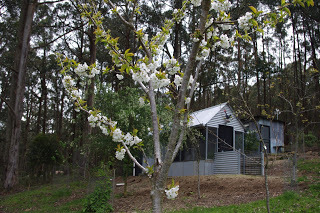 The fruiting cherry trees have decided to produce blossoms this week. 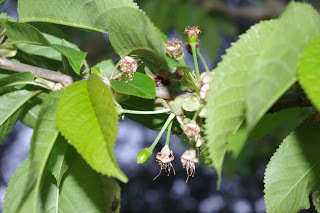 I always have this feeling that despite my experience from prior years, the birds won’t get all of the cherry fruit. Maybe? The Asian pears are not quite as showy as the fruiting cherries, but clearly they decided that there was a bit of competition going on and so they had better produce some blossoms too! 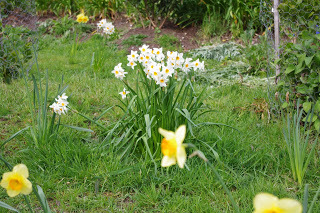 At this time of year, the various daffodils can’t be beat for showiness and most of them have a delightful perfume. 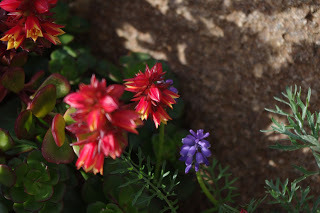 The editor has a soft spot for the many succulent plants growing about the place and so to do the bees who all seem to enjoy the flowers. This next one is a little ripper! 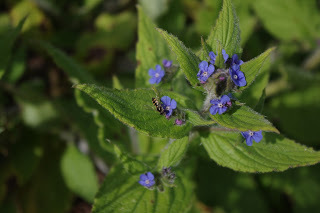 Speaking of bees, the native bees have made an appearance too, and I spotted this one on an Alkanet, which is a member of the borage family (which also makes great all year round chicken feed too). Nothing, but nothing beats a solid hedge of Echium plants for bee food. 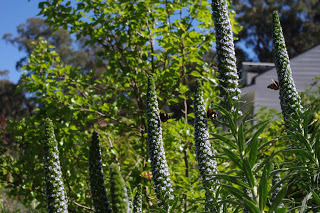 These plants produce flowers for about ten months of the year and the bees are thick around the flowers. Our politicians would do well to remember that the Golden Rule of: “Do Unto Others” applies to themselves. No more Fords for them, maybe they only like Bentleys? The temperature outside now at about 9.45pm is 3.7’C (38.7’F). So far this year there has been 1,020.2mm (40.2 inches) which is up from last week’s total of 998.4mm (39.3 inches). 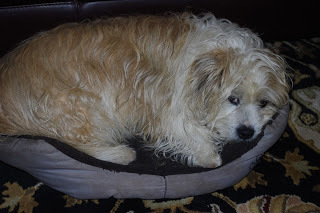 I’d like to introduce a new member to our group – Bones Anonymous – tonight and was hoping that everyone can make Sir Scruffy, who is on his first meeting, feel very welcome here. Can you tell everyone something about why you are here tonight? The moderator then hands the talking stick to Sir Scruffy who accepts it with good grace. Thanks everyone for making me feel welcome as I’m a bit nervous as this is my first meeting and all. By the way, we can drop the whole “Sir” thing here as it is just Scruffy. Yeah, thanks again. Um, well, I’ve always had this problem with bones and the enjoyment is no longer there for me. I see a bone and it becomes a personal challenge and I turn into a horrid monster. Yes, thanks, I appreciate the disbelief, but here I feel I must keep it real and tell it like it is. Yes, that’s right: horrid monster. It all came to a bit of a head about two weeks ago when I was enjoying the Spring sunshine and totally destroying, sorry I meant enjoying, a quiet chew of my beef bone when Poopy the Pomeranian (he is technically a Swedish Lapphund, but let’s not give him airs and graces shall we?) walked way too close to my bone. Not fair, it was my bone, I tell you. Oh sorry, there I go again. And anyway, Poopy copped a good, well deserved and proper biting from me and our dog fight extended for quite a distance into the orchard. Who would have thought that Poopy would have put up such a good fight? Not I! He is pretty handy in a scrap. Anyway, that is when things turned really ugly. My owner Chris, had to break up the dog fight which I would have won. Chris grabbed me by my collar and dragged me back into the house. Poopy got the bone too. What was worse was that Chris looked me in the eye and said: “You used to be the best dog in the household! What has become of you?” At those words, I felt shame, although technically I still was the best dog in the household, merely because no other dog had seized that title. I had to admit though I do have a problem with bones and I was the major contributor to the ongoing canine Bone Wars. Yes, I freely admit that I have a problem with bones. I used to be the best behaved dog, before the bones. Well, technically, I still am the best behaved dog amongst a very motely pack; surely my owners understand that I’m still the same dog underneath it all? It will all blow over in time, maybe. Anyway, I’m here tonight because, well, I want to find a way back to that unquestioned best behaved dog status. 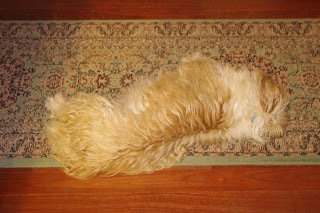 It was a good thing being the best dog ever, as I got to sleep on the floor in the bedroom. I acted as the interpreter for the outside dogs too during the night. 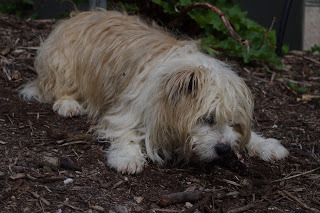 For example: Are those fools barking at another boring wombat (unless it was wombat bones… Mmmm wombat bones!) or are they barking at something that needs human attention, like the when the drunks drove down the driveway late one night. How good am I? Look, my problem began because I just never had bones as a puppy. None! No bones, anywhere. Not even wombat bones. And bones are the best ever! Look at my bright shiny teeth. Yup, I just can’t control my feelings towards the bones. So, I’m here tonight looking for a canine sponsor to help me control my bones compulsion. As long as it is not Poopy. Who’d want Poopy as a sponsor? 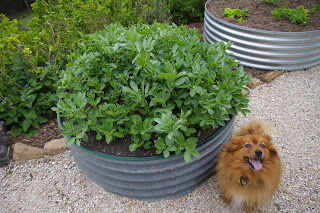 Look, the other day he was posing for a photo beside the rapidly growing broad beans. What a showbag that dog is, he looks good on the outside, but is totally full of rubbish on the inside. And he wants my bones. Oh no, do I have to make amends with Poopy? Someone in the Group: Yes, Scruffy, it probably isn’t a bad idea to make amends for your past behaviour with Poopy. What! Well, perhaps I better make amends with Poopy. You don’t know what sort of week I’ve had. It has been one tough week. Moderator of the Group: Tell us about your week Scruffy, but don’t rubbish on too much or I’ll call it time on you. Oh, well, OK, I can do that. Well, this week it has been waaaaay windy! Do you know how hard it is to look cool when the wind is blowing so strongly that a dog looks exactly like a shag pile carpet from the 1970’s! Yeah, and not like that carpet looked back in the 1970’s when it was new, but as the same carpet would look today. Honestly, it is enough to send any best behaved dog in any household back off the wagon and onto the bones. Earlier in the week, I wasn’t able to enjoy bones because it was cold. Really cold, so I stayed inside the house as much as possible and practiced my next best gift: Sleeping. And I’m really good at sleeping. I can sleep in the hallway, which has a very nifty in built library, although none of the books have anything useful to say on the subject of bones. Hang on, is that an anatomy book? Oh, interesting! But my other favourite spot to explore my gift of sleep is in my sleeping basket. That basket is mine and when I see Poopy sleeping in it, the first thing I do is dob on Poopy! And Poopy always gets evicted, because I was the best behaved dog in the household. So there! 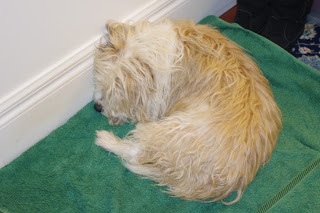 Best of all, the sleeping basket is near the wood heater and I feel toasty warm at night, when other lesser canines have to sleep outside. Observant listeners will notice that I look less than impressed in the above photo. Well, there is a good reason for that bad attitude. That’s because the wood heater has been quite smoky this week and hasn’t been putting out much heat. 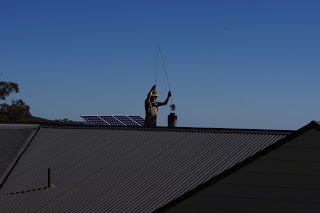 Anyway, on the first dry sunny day, I sent Chris up onto the roof to clear out the wood heater flue. He is very clever and can climb up onto the roof. You would not see me up there. Apparently the extendable brush was pushed a long way down into the flue of that wood heater. It is a very clever idea, and I certainly would have come up with such a clever idea if anyone had bothered to ask my opinion. Not much soot fell out of the wood heater flue that day. 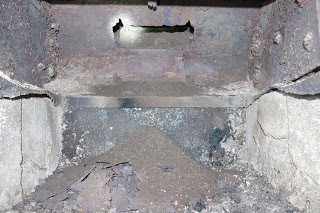 What actually happened was that a whole lot of steel from inside the combustion chamber had delaminated and blocked up the flue. As I am a sophisticated and intelligent canine of noble breeding, I will not recount the exact words used by Chris to express his dissatisfaction with the wood heater as they included a number of extraordinary and inventive expletives. 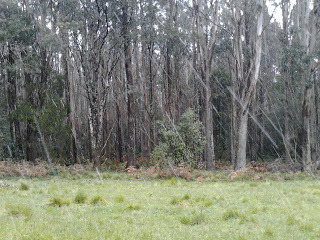 Who cares anyway as the heater is now burning strongly again. Chris probably needed a nice bone to calm him down. Bones aren’t the problem, they are the solution! Ooops, can I say that here? Sorry for the slip up. Yes, bones are bad. Chris was clearly a glutton for punishment this week as he dug up various sections of the gardens watering system today and laid the pipes over the surface. 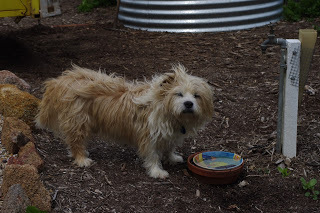 Of course, on a recent dog walk in a local botanical garden I happened to point out to Chris, that those clever gardening people also place their water pipes on the surface and how come we don’t too? Well, I did get a rather withering look from Chris, so I shall keep my opinions to myself in future. One doesn’t want to buy more trouble. Who knows what things humans are doing all the time with their constant tinkering and digging. Pah for that! The only digging should be when you are digging up previously buried bones, that’s proper digging that is! Sorry, it’s the bones you see… I just can’t help it! Given the humans didn’t want me around, I thought I’d do a show and tell for the group and take you on a quick tour showing how everything is going! 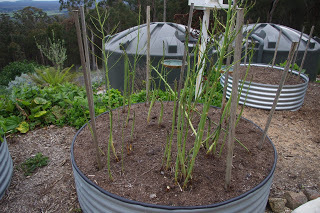 I noticed today that they put some sticks into the two asparagus beds. I don’t know what they’re doing and no doubt, they don’t know what they’re doing either! Still, they must know something, mustn’t they? Then I spotted this mysterious flowering bulb. No doubt someone at this meeting will hopefully be able to tell me what it is. Anyone? Then I can show those humans just how smart I am? Well, I was the best behaved dog after all. Flowers, flowers and more flowers! Can you eat them, that’s what I want to know? 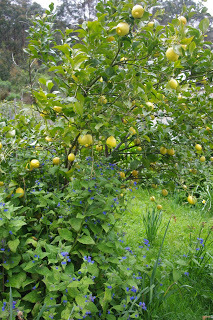 I can’t even reach the quince flowers either, but I’m told that they are very attractive. Yeah, yeah, more flowering bulbs. 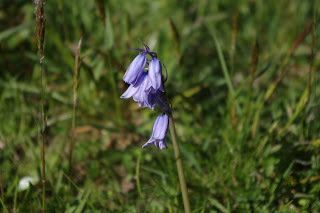 Blue bells this time. And don’t forget that I was once the best behaved dog in the household! 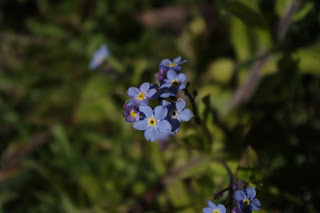 Oh yeah, it is not about me is it, because the next flowers are forget me nots (Haha! How good was that joke, I told you that I was a clever dog!). 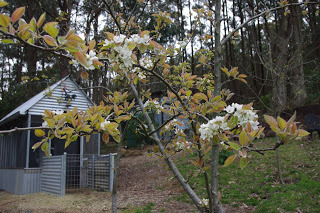 The flowers on the pear trees are again out of my reach. I only wanted a taste of them. How unfair! Anyway, there are a lot of unreachable pear flowers this week. Dogs like chips and I am no exception. Of course being an intelligent dog, I realise that chips come from potatoes so it is very good that Chris planted a lot of them this year. And best of all they seem to be growing well! 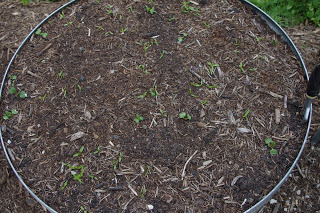 The radishes have also germinated earlier this week. Seriously, what sort of dog eats radishes? What do you mean that you put white radish into my dog biscuit mix. Yuk! I like bones, but I also like strawberries and it is a total disgrace and a major chunk of unfair that Chris and the editor put layers of bird netting over the many strawberry plants just to keep me out. Not fair at all I tell you! Several layers of bird netting were placed over the many strawberry plants to protect the fruit and plants from pretty much everything! Being an old dog, you kind of remember the past and stuff. So I wanted to show a before and after shot to show what is possible for a reasonably neglected garden bed in four years which was the time between the first photo and the second. Thanks for listening to my story and with your support and sponsorship I promise to be better behaved in the future. Woof! Woof! And also serious apologies to Gerry Rafferty for destroying his most excellent song Baker Street. Dogs will be dogs! The temperature outside now at about 8.15pm is 8.3’C (46.9’F). So far this year there has been 1,040.8mm (41.0 inches) which is up from last week’s total of 1,020.2mm (40.2 inches). The farm is surrounded by dense forest and the dominant local tree here is: Eucalyptus Obliqua, or Messmate as they are more commonly known. These eucalyptus trees grow very tall and can eventually reach a height of 90m (just shy of 300ft) and live for around 400 years. They are not the tallest tree down under, and they are not even the tallest eucalyptus tree growing in this mountain range. The award for the tallest tree in this mountain range goes to: Eucalyptus Regnans, or Mountain Ash, and those trees can reach in excess of 100m (just shy of 330ft). In fact Mountain Ash is the tallest flowering plant on the planet. 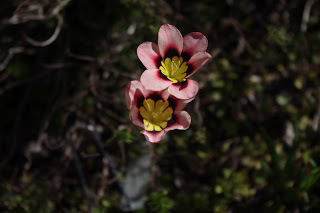 Very occasionally the messmate trees on the farm (and indeed in the surrounding forest) decide to produce flowers. It is rare event when they do produce flowers as it is only once every couple of years. During those flowering times, the entire mountain range smells of honey. 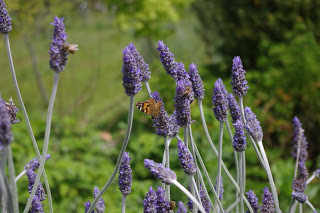 The buzz of insects harvesting the pollen and nectar during the day is almost deafening but the smell is beautiful. 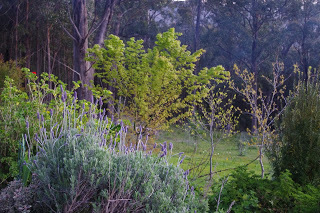 However, the inner urban areas of Melbourne smell very different to me and sometimes it can be a bit of a shock to leave the pleasant smelling forest here. 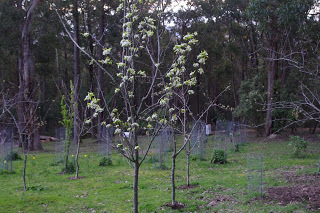 The other day I was in Melbourne on business and I noted that the many London Plane Trees (Platanus × acerifolia) were growing strongly because of the very wet winter. London Plane Trees are a popular urban roadside tree as they are not only drought and heat tolerant, but they are also very tolerant of atmospheric pollution and root compaction. They are just like Scritchy the boss dog, one tough customer! Every year those London Plane trees drop short, stiff hairs which are shed by the young leaves and the dispersing seeds. Those hairs are my kryptonite, as they are a total irritant if I breath them in! And that is exactly what happened that day. I was inside a building and somehow happened to accidentally breathe one of the hairs in and I ended up having a massive coughing fit which soon passed (thankfully). 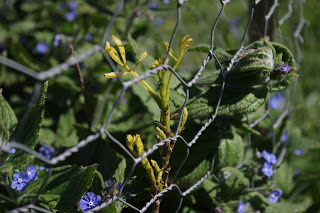 It was very distressing and it was also very lucky for the offending trees that I did not have my chainsaw ready to hand… Why anyone would plant those particular trees is well beyond my understanding? And surely there would be better species with which to line the urban mono-culture with? Pah! We are not friends those trees and I! 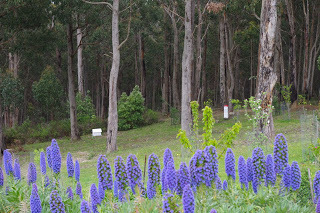 Speaking of chainsaws, long term readers will recall that I semi-regularly employ some local blokes to assist with managing the forest here and have done so for years. The relationship between those blokes and the editor and I has not always been smooth sailing, but I have long since come to the conclusion that: they need the work and I need the assistance; and so everyone benefits from that arrangement. Problems become water under the bridge in such circumstances when the realities of both sides are faced. They can do the work and I want the work to be done and so what is the price? It is all a very pragmatic arrangement and that is part of living in a community. 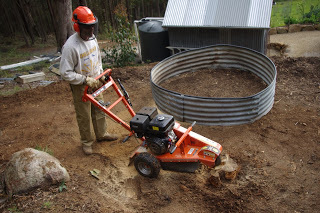 Grinding a tree stump is a huge job and requires a specialised machine. 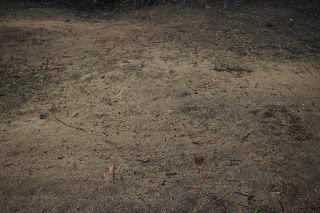 However once the tree stump is converted to a fine saw dust by the machine, that saw dust is then mixed with the surrounding clay and top soil and ultimately raked flat. The increased surface area of all of that organic matter is a true heaven for earthworms and they digest the contents and convert that to worm manure. 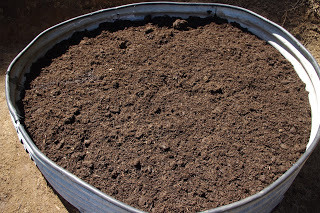 Soil organisms then feed on the worm manure. Those soil organisms then provide minerals to the plant root systems in return for the sugars produced from photosynthesis on the sunlight falling onto the plant leaves. The plant leaves are also eaten by the many animals who in their turn produce manure for the soil organisms to eat and around and around the soil fertility cycle goes! Last week, the editor and I planted out over one hundred tomato seedlings into the tomato enclosure. Well that night a very heavy rain storm knocked all of the tomato seedlings flat to the ground. Then a few days later on Wednesday morning, a light frost hit the farm and only three tomato seedlings survived! It was an impressive set of weather circumstances and it is very fortunate that we grow many more tomato seedlings than we actually require. 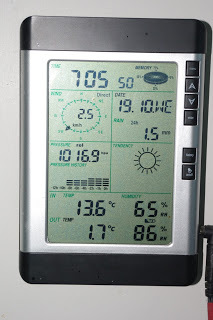 Observant readers will note that the outside temperature was 1.7’C (35’F) whilst the inside temperature was 13.6’C (56.5’F)! I know of so many people who have trouble sleeping and have for many years wondered whether they are over heating their houses and have speculated as to whether that is the cause for their insomnia. Yes, tech nerds of the world unite and go feral with that graph above! Everyone else can skip this paragraph! The blue line shows the battery storage state of charge at the beginning of each day. As you can clearly see it drops down low every winter – but some winters are lower than other winters. The red graph shows the usage of the petrol generator. 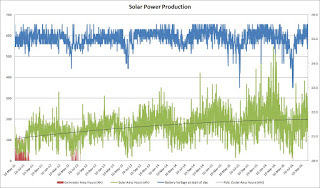 And the green graph shows how much solar electricity I have generated and used. 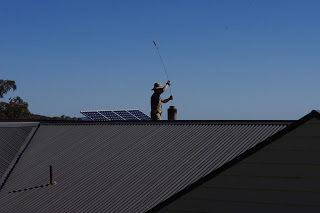 Observant tech nerds will note that in the past few years, I have barely used the generator, and am also slowly learning how to get the most out of the solar electricity that is produced, particularly in summer. 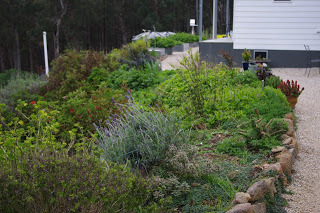 The newly planted fern gully is thoroughly enjoying the very wet conditions this year. 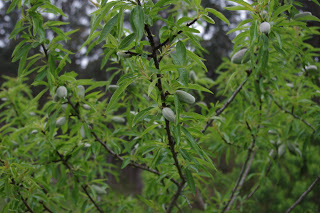 Almonds don’t seem to be bothered by the wet or cold conditions either and the nuts are swelling on the trees. I will attempt to net this particular tree before the local birds crack all of the almond nuts open and eat the contents. 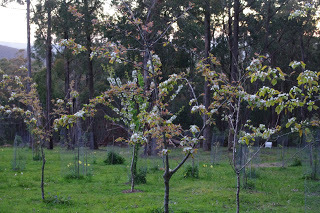 The cold and wet conditions have meant that the late flowering fruit trees have fared much better than the earlier flowering fruit trees. 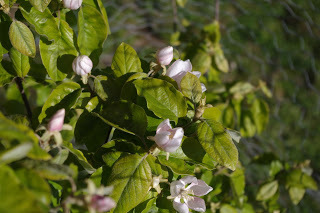 The quince trees continued to flower this week, but now the medlar fruit trees have also produced blossoms this week. 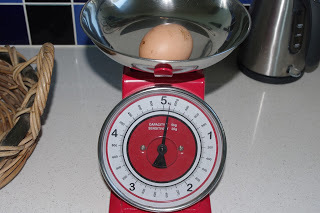 Which weighed in on the scales at 110g (3.88oz). Ouch! That poor chicken. 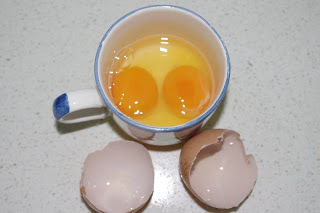 Anyway, the freaky large egg ended up having a double yolk! 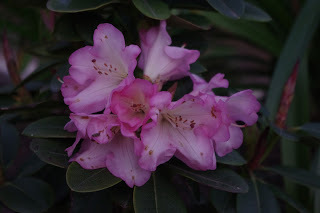 The rhododendrons have started producing their flowers this week and I reckon they look great. 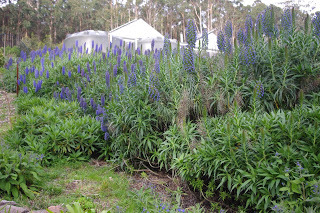 The Echium flowers are still continuing to provide food for the bees who have been unable to fly from their hive every day as they probably need to, because of the continuing cold and wet conditions. 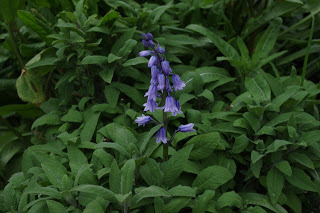 The bluebells are showing off their flowers this week too, and the next photo has a bluebell surrounded by sage leaves and an evening primrose. By sheer accident (as often happens here) I purchased a huge bulk pack of poppy seeds. As I walked out of the nursery, I thought to myself that that was an expensive purchase, not realising that the nursery charged me $30 for a small packet (which contained 1,000 tiny seeds). Anyway, I had 1,000 (!) poppy seeds and thought that that might have been a bit of overkill, as no doubt that it was. 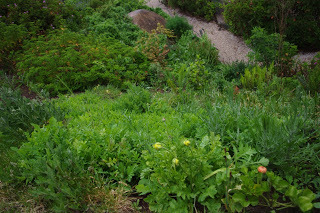 I threw some of the poppy seeds over one of the steep garden beds, and it now looks as if most of the seeds have taken…. Triffid alert!!! Run for your lives!!!! The temperature outside now at about 8.45pm is 4.9’C (40.8’F). So far this year there has been 1,060.8mm (41.8 inches) which is up from last week’s total of 1,040.8mm (41.0 inches). Sometimes I find it hard to know who is trying to subvert whom. You see, I was in Melbourne last week, and my travels into the big smoke generally come with a long list of things to do! One of those items on the to do list was to enjoy a quality coffee and muffin and take a few quiet moments to enjoy a couple of pages in the latest book that I’m reading. The café in question sources some of their coffee beans from a family run farm and they then roast their own coffee beans at the back of the café. Oh, the coffee is good and the muffins are to kill for! Anyway, another stop on the to do list was to get my hair cut. In recent weeks I had begun to look a bit scruffy, well that is what the editor was telling me anyway, and so I booked in an appointment at a business that I have been frequenting for more than a decade. Getting ones haircut is always a complex issue for the male of the species. As a delaying tactic, I tell the editor that if I was to get my haircut, I would definitely lose mojo. And I mean, who wants to lose mojo? You see, when I was in my late teens to about my mid-twenties I had long flowing locks and a pony tail, but alas time moves on and so too does the male hairline – and thus time stole some of my mojo. So I dither and prevaricate and generally put off getting my haircut until the editor stamps her foot (as an interesting side story, the editor cannot stamp her feet this week as a cheeky ant bit one of her feet and her big toe has swollen to beyond its usual foot stamping capacities!) and – correctly too – tells me that enough is enough. At that point in time, I book an appointment to get my haircut. Don’t let the editor know this next bit but, it is kind of fun getting one’s haircut. This month there was a new guy and for about three quarters of an hour we just talked bloke stuff and he told me stuff about himself and I shared many funny stories from here. There was lots of laughs and sheer silliness. The new guy did a pretty good haircut too and the editor – in an ultimately fruitless attempt to get me to cut my hair more often – told me that I had actually gained mojo through a particularly good haircut. Surely this was a new strategy on behalf of the editor? At some point during the haircut, the new guy asked me whether I’d seen a particular show on television. That particular question is a surprisingly common question. And I replied that I don’t actually watch much television. As a disclosure, regular readers will recall that I am something of a fan-boy of the very long running television show: Grand Designs UK. But other than that show, I just don’t watch television and haven’t done so for a very long time. So as the new guy and I were chatting away, at the back of my mind I began wondering whether the question that he asked was an attempt to subvert me to his world view or whether my reply was me trying to subvert him to my worldview. It is a fascinating question isn’t it? The word subversion, from which the verb subvert is derived, is defined as: seeking or intended to subvert an established system or institution. I like the sound of that definition as it sounds a bit “Fight Club” to me! But then my mojo was left behind on the floor with my discarded hair, and then as the hours and days went on whilst I was enjoying my new haircut, I continued thinking about who was trying to subvert whom? And I’m not really sure of the answer to that question. You see I don’t have a desire to obtain a lot of stuff that other people aspire to owning. How about that big screen television? No way! What about the dishwasher, or the smart phone? Nope, none of those items are for me. And I certainly don’t want to go into debt just to own a large SUV because I require a prop for my phallus! There are just so many material things that I don’t desire, that sometimes I feel that it is mildly subversive to deliberately turn your back upon the world of plenty. In return for not pursuing those material things, I get to enjoy both a quiet environment and the time to enjoy it. I still have to work hard here, however I can define how I spend my time. If for example the weather conditions are less than optimal, I can do something else that doesn’t require me to be outside. Our ancestors had that freedom, so it is not a new thing at all. I still have to participate in the economy and earn a living, it is just that by not desiring the usual material things, I can participate less in that economy than many other people do. There are both costs and benefits for either of these paths. I did tell you that this was a complex question! Last week all of the tomato seedlings planted died in a late frost. Perhaps it could be said that the tomato seedlings had lost their mojo? 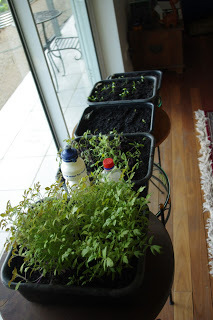 A few days ago, the editor and I planted out about half of the remaining tomato seedlings and then we crossed out fingers and hoped that the light frost was not repeated! Observant readers will note that to the right of the above photo an entire row of gooseberry cuttings has been planted directly into the rich soil of the tomato enclosure. Speaking of working hard… Sometimes one has to work a little bit harder to regain lost mojo, and so it was that this week that I decided to clean up a bit more of the old logging detritus which is dotted about the farm in the most unlikely of spots. Logging in this mountain range has been going on since about 1860. In this part of the mountain range, it did stop many decades ago. 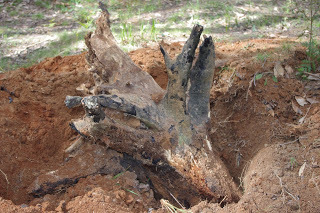 That doesn’t mean that the detritus has broken down into quality soil, and the above photo shows a blackened tree stump sticking out of the ground. 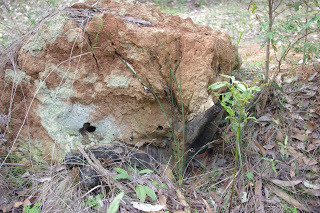 However, the tree stump is completely upside down and covered in compacted soil. How the tree stumps ended up like that is well beyond me! There have been quite a few of them which I have cleared up over the past decade, so I have been getting better at removing them. The first step in that process is digging away all of the soil from the tree stump. Observant readers will note that the tree stump had been burnt at some stage in the far distant past as it shows blackened scorch marks. 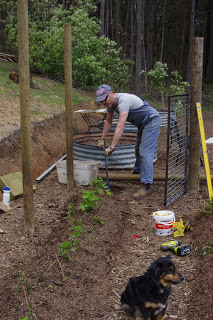 The tree stump weighed far more than I do and so I used a very large steel house wrecking bar to lever the tree stump from the hole that I had dug. 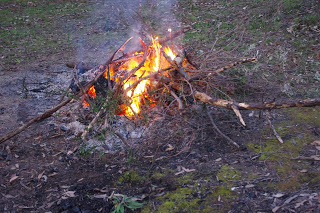 Once the tree stump was mostly clear of the soil, I was then able to cut up the tree stump into smaller pieces using the chainsaw and then burn it off. The tree stump was unfortunately far too wet to be able to be burnt as firewood. 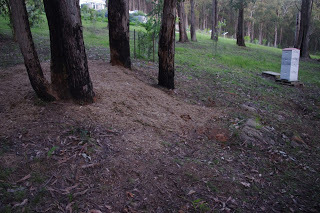 The hole that was left over from removing the tree stump was then back filled with the soil which had been surrounding the hole. 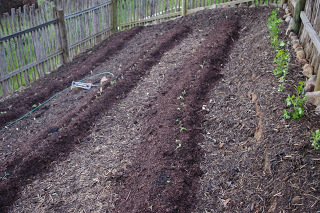 Over that newly flattened soil surface, I spread chicken manure and soiled chicken bedding. 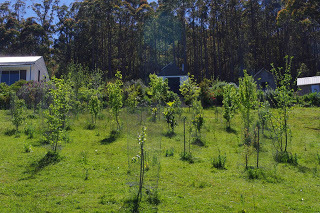 In another years time, that area will look green and lush and the native wallabies, wombats and kangaroos will enjoy the extra feed. Surely that good deed will earn me some additional mojo? There is no shortage of firewood here as the big trees are constantly shedding huge branches and last evening this monster branch fell into the edge of the orchard. Note the previously fallen tree branch in the background of the photo below. Please don’t get the incorrect impression that I’m some sort of luddite! Some of the manufactured products that are available to purchase just amazes me. And they are usually far cheaper than a big screen television too! 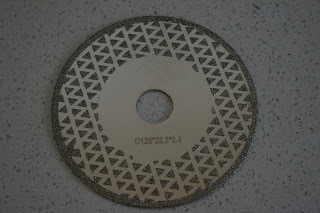 This week, I finally received delivery of a couple of grinding discs which have the most beautiful pattern of industrial diamonds on their surface. The discs are going to be used to sharpen carbide steel tools. You have to use industrial diamonds to sharpen carbide steel as that steel is just so crazy hard that few other products will actually cut it. Imagine trying to explain to an emperor two thousand years ago, that we can purchase a cutting disc which is covered in diamonds and is sold by traders for the price of a few coffees plus a couple of very tasty muffins and a haircut! 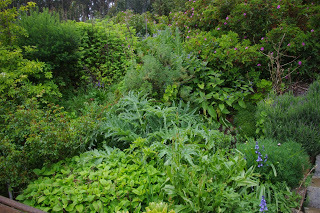 Long term readers will recall the many hassles that I have had recently with the watering system for all of the garden taps. This week, I upgraded the water pump which is the heart of the system to a slightly larger and better made water pump. 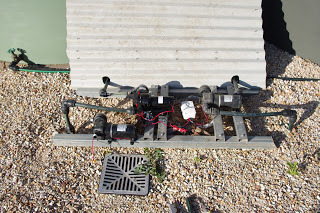 The money spent on that water pump is not even close to being the equivalent of a big screen television, but that water pump is a very important piece of infrastructure for the plants, so it just has to work. 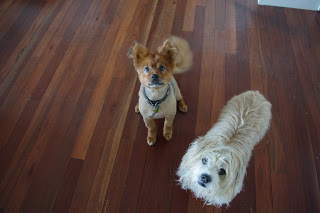 Poopy also lost his mojo this week and clearly the editor has had a major hair offensive campaign brewing for a while! Sir Scruffy survives intact – currently! 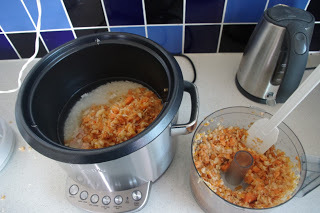 Speaking of dogs, I have been experimenting with the dogs breakfast meal and I have discovered that the dogs enjoy blitzed seasonal vegetables with basmati rice! I spotted the very first small green cherry this week. It would be nice to harvest some cherries before the local parrots do. 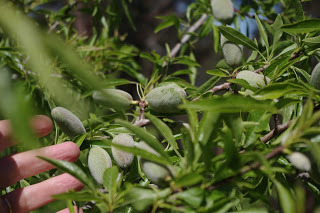 The recent rains have caused the almonds to swell to even larger sizes this week. 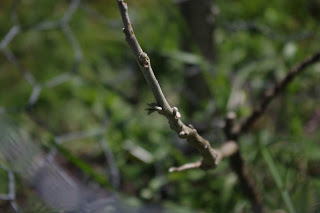 Despite losing most of the apricot fruit this season to both heavy rainfall and the occasional light frost, I spotted about a dozen apricot fruit still slowly swelling on the dozen apricot trees. What a bumper harvest it will be! 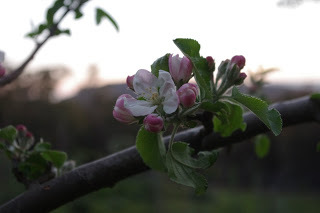 The apples and pears are far more sensible fruit trees as they flower and fruit much later in the season, and they are all producing huge quantities of blossoms this week. And I just thought that it would be nice (and perhaps I may gain a bit of extra mojo by doing so?) to share a photo of the spring sunshine sparkling off some of the younger fruit trees in the more sunny orchard. It just looks nice! When the sun shines, the air is full of the buzzing of insects. It is really great to listen to them all and see them go about their business. 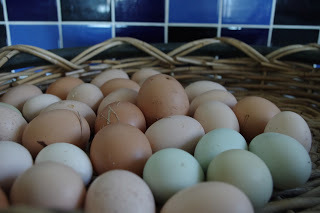 There is so much going on in the farm with the warmer spring conditions, that I wouldn’t have time to watch a big screen television, even if I wanted one! Which I don’t. The temperature outside now at about 9.30pm is 7.3’C (45.1’F). So far this year there has been 1,066.4mm (42.0 inches) which is up from last week’s total of 1,060.8mm (41.8 inches).